After you have gathered schedules, one of the next important tasks is crafting your schedule and sharing it with the dozens of teachers, administrative staff for accountability. You will need to manage it for your own access which can be by printing, memorizing it, or sending it to an electronic device for reference if you carry one with you for frequent access. How will you use and share it? Create, share and maintain on your computer? There are many ways to create, share and maintain your schedule. You most likely have your tried and true schedule templates and methods you’ve used for years to create your schedule. Certainly creating a schedule in electronic format is not a new idea but is the most flexible method to share, edit and revise, a continual process in my experience. Using a Word document (or some other word processing or spreadsheet application) has been standard. In the era of Google accounts in schools, Google may offer a few other options that can be a more efficient method of sharing, revising and accessing therapy schedules using your Google account and apps. A. Use a Word document/Excel template to create a daily schedule. The easiest way might be to use your own Word document template you’ve used for years. Call it done. When it done email it to respective personnel. Copy it and hand it out. If you have your email on your iPad, after sending, open the document on your iPad and save it in Notes or another document management app for referencing through the day. Another option is to take a photo or screen shot of the schedule and store it in our photo album for reference. You are done until your schedule changes… tomorrow, then revise in Word, send, print and share again. 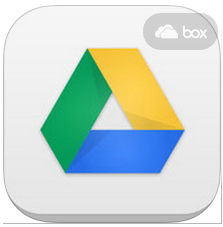 B. Google Drive provides a few more options for sharing and creating. 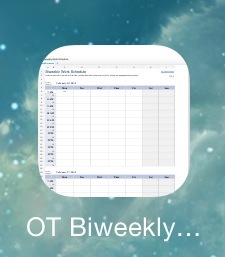 Here are a few thoughts that might reduce some steps and allow you to edit your schedule on the fly using your iPad. 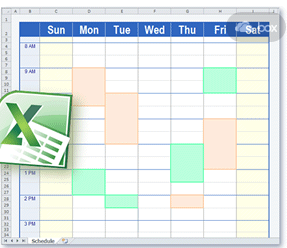 Create a schedule in Google Docs (insert a table in a Doc) or Google Spreadsheet. Don’t want to mess with creating a new daily schedule? Use an existing template with the new Add-ons tool and adding in the Gallery Templates add-on in Google Docs and Presentation. It makes for easy work with the existing templates. When in Google Docs there is a new menu item, Add – ons. Click on the Add-ons menu. Click on Get Add-ons. You will be taken to a listing of Add-ons choices. Locate the Gallery Templates Add-on. 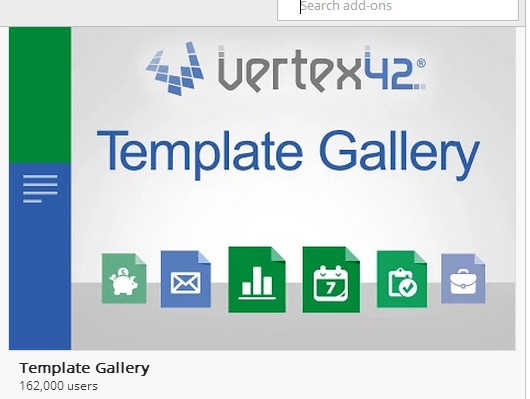 Select and Accept the Gallery Template to add this tool to your Google Docs. The Gallery Templates add-on will be available for your use from the Add-ons menu. Browse the choices of calendars and forms available in the Gallery. The Gallery’s Planners and Schedules category has weekly schedule and biweekly schedule templates available. Select the template and download a copy to your drive. Find the template (look for Copy of… documents in your drive. Rename and it is ready to use. You can edit the document or use it as is! Create your schedule using the schedule template in Google Docs. You now can share it, print it, email it from your Drive. You can also open it in the Google Doc app on your iPad. It can also be designated as used Offline if Wi-Fi is limited on your device. The Google Doc can be edited on the fly on your iPad. Don’t have the iOS Google app? It is free and compatible with iPhone and iPad. A Google Sheets app is also available for free. Another benefit of using Google Docs is the ability to copy the URL of the document and create a Home Screen icon on your iPad for easy access to your schedule. Yet another benefit is when you edit the same schedule document/spreadsheet in your Google Drive (not rename it. ), the updated versions will still be at this Home Screen icon, on your iPad Google Doc app if it has been sync’d with Wi-Fi or as shared with others. Don’t want to download or create your own Google Doc OT Schedule right now? 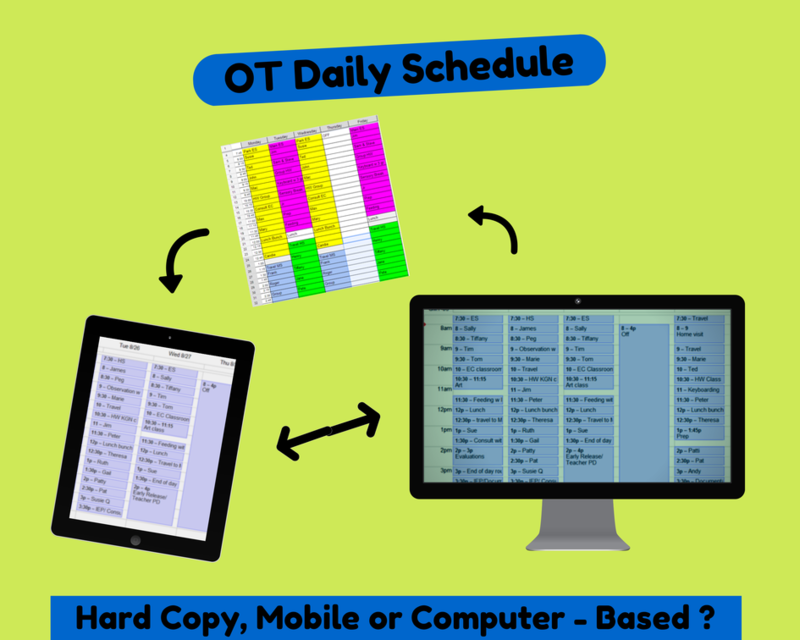 OT Daily Schedule with 15 minute increments. If you have tips or tricks about managing schedules, please share. There certainly are many ways to “skin the cat”! This entry was posted in Administrative Apps, Apps for OT's, Google, Google Chrome, Google Docs, iOS, iPad, iPad Management, Occupational Therapy, School Based Interventions, Therapist/Teacher Tools. Bookmark the permalink.